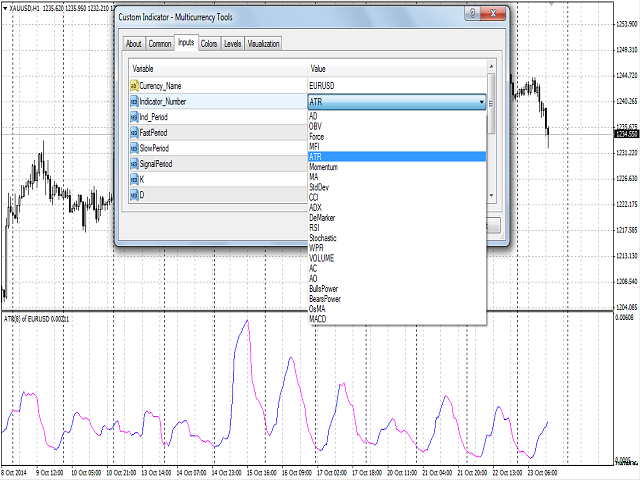 A multi-purpose multi-colored/multi-symbol indicator, which is a set of standard tools from the MetaTrader 4 terminal. WPR - Bill Williams oscillator. AC - indicator of acceleration. OsMA - moving average of oscillator. 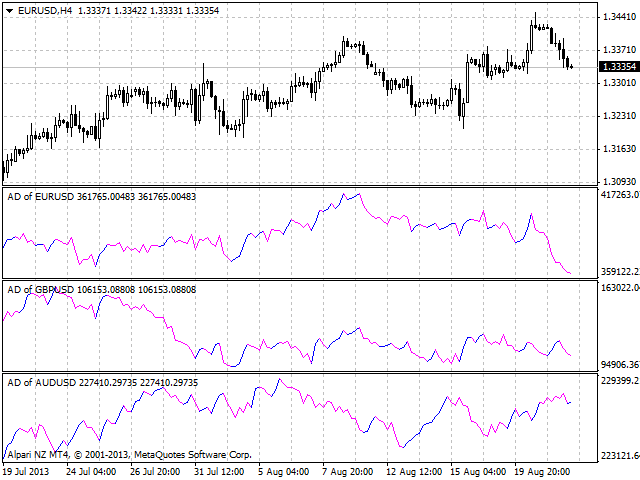 MACD - moving average convergence/divergence. The default indicator is AD - an indicator of accumulation and distribution of volume. The indicator may be used with any broker, irrespective of the name of the financial instrument since it is necessary to manually enter the name as an input parameter. If you enter a non-existent or incorrect name of a financial instrument, you will receive an error message that this financial instrument is unknown (does not exist). Currency_Name - the name of the financial instrument. 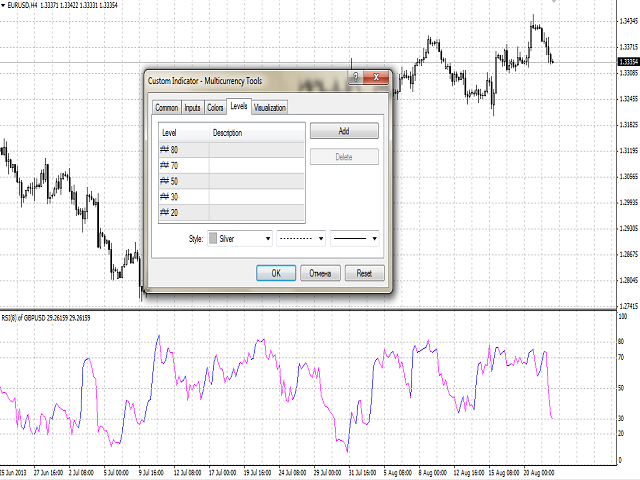 Indicator_Number - the serial number of the calculated indicator (one of twenty on the list). 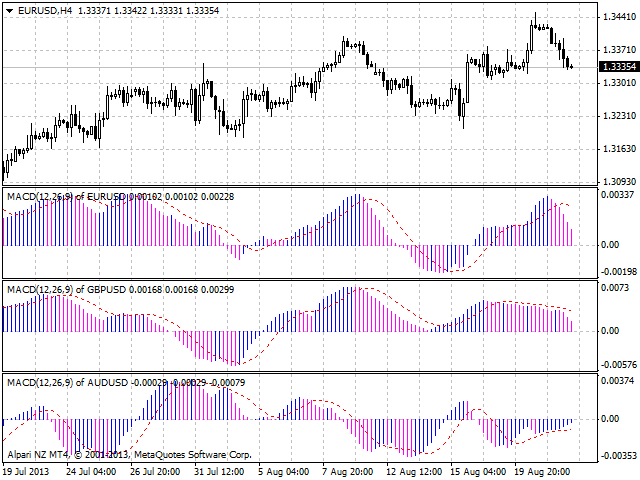 Ind_Period - the period of the indicators. FastPeriod - the period of fast MA for OsMA and MACD. SlowPeriod - the period of slow MA for OsMA and MACD. SignalPeriod - signal line period for OsMA and MACD. 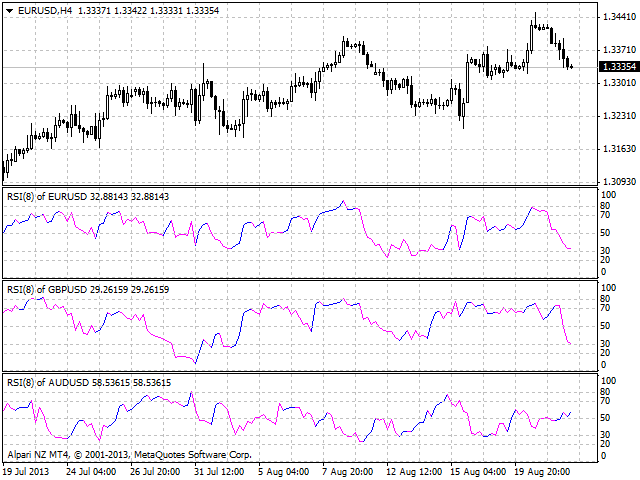 Slowing - the slowing value for Stochastic. Shift - Shift relative to the price chart. The indicator automatically draws internal horizontal lines between the maximum and minimum. The lines of the maximum and minimum must be set manually. 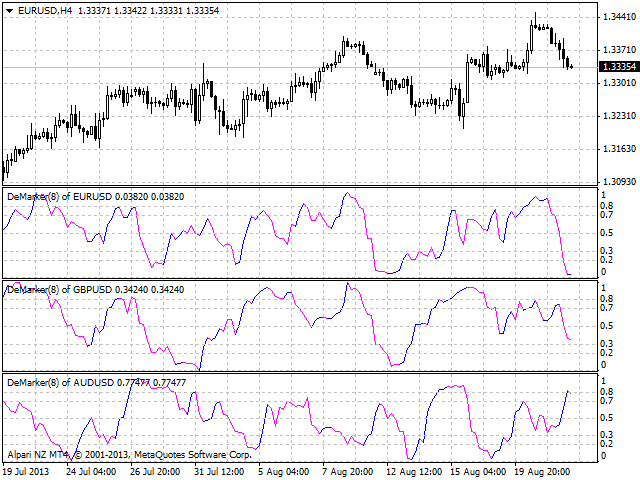 For example, for RSI and Stochastic - 0 and 100, for DeMarker - 0 and 1. 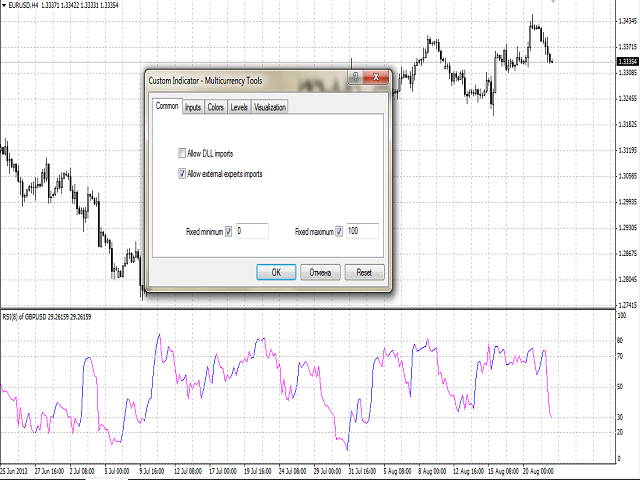 When you change, that is recalculate indicators,maximum and minimum lines of the previous indicator should be changed or disabled, internal lines should be deleted. The simple procedure is shown in the video. To simplify the procedure, remove the previous indicator from the window and attach the new one. 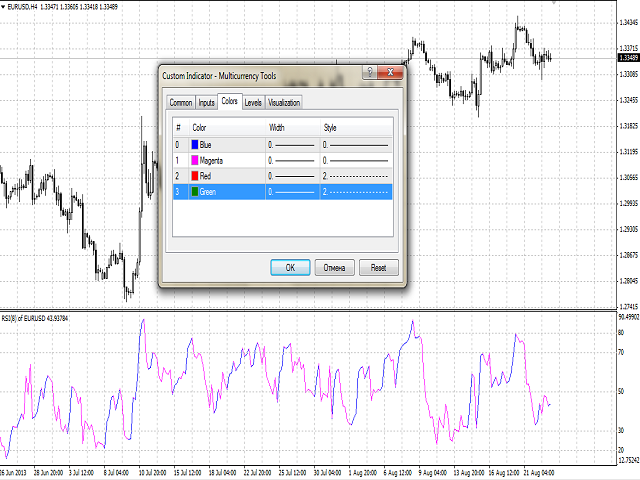 The line/histogram of the indicator - buffer 4. The growth line/histogram (bulls) - buffer 0, must not be empty, i.e. equal to EMPTY_VALUE. The fall line/histogram (bears) - buffer 1, must not be empty, i.e. equal to EMPTY_VALUE. 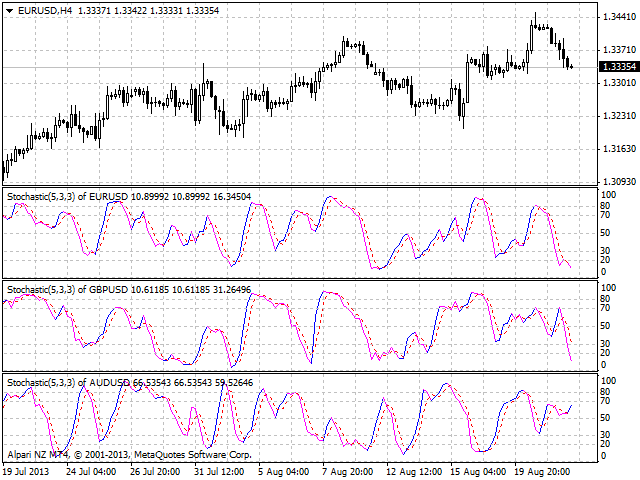 The signal line for ADX (+DI), Stochastic, MACD - buffer 2. The signal line of ADX (-DI) - buffer 3.